Mohamed A. El-Erian and Kemal Derviş . The articles were about how U.S. Federal Reserve and other central banks are shifting priority from inflation to unemployment. Apparently, Fed chairman seems to have made an explicit statement about targeting unemployment. One of the authors, in particular, pointed to low-cost global workforce and labor-saving technologies to be prominent factors contributing to the growing unemployment. I think these factors are factors that are here to stay. To ensure that young people acquire skills required to participate in global economy, we need to point their learning energy towards such sectors that are relatively immune to the above factors (e.g. Medical Research, Fundamental Scientific Research, etc) and last for a career long. A general dumping of money into economy might mean inconsequential investment in certain sector-specific bubbles. We need to nurture the 'long-term' sectors by providing alternate and long term capital through a sector-specific approach. 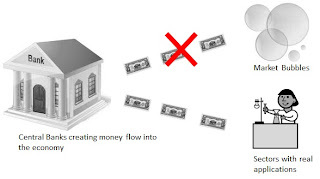 Central Banks have to discover sector specific tools to control money supply. To sum up, I think Central Banks can no longer follow the same thought paradigms as in Early Industrialization Era where all industries/sectors were the same.